Connecticut athletes have been doing quite well down in North Carolina the past few days. 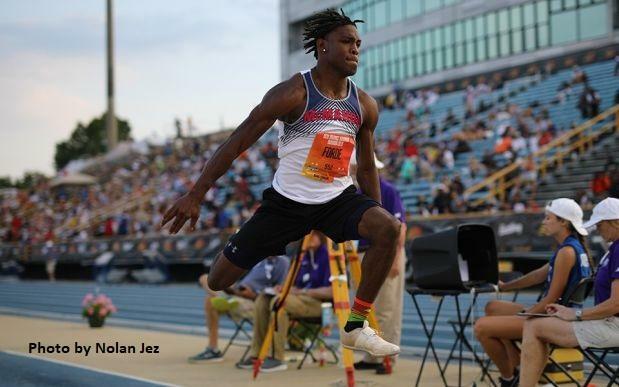 On Saturday, Brien McMahon's Justin Forde broke 50 feet for the first time in the triple jump on his 3rd jump and soared to 50-03.25 to take 4th and earn All American status. The junior is only 1 feet 7 inches off the all time Connecticut state record of 51-10.5 by Rayford Sutton of Hillhouse set in 1994. Click here to see Justin's jump. Alexander Korczynski of Windham bounced back from his 2nd place finish in the 1600m and 3rd place finish in the 3200m at the New England championships last Saturday to take 4th in 9:07.83 in the two mile race. The Northeastern bound season has rewritten the Windham and ECC record books to earn his first All American honors. New Milford junior Eli Nahom of New Milford now has the state lead in the 3000m steeplechase and 2000m steeplechase events after he ran a 6:17.83 to take 27th place. Xavier boys finally reached their goal of setting their school record. 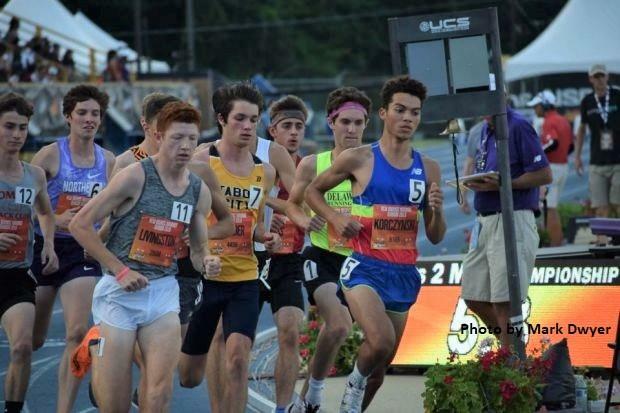 The team of Pierre Sylvain, Peter Schulten,Trevor Christie and Owen Lally ran a 7:50.22 to break their old record of 7:54.87 set at Nationals in 2001. Derby, the smallest city in Connecticut, showed they can compete with the best in the country. Bevon McLean, Steven Stanley, Ja'Kwan Hale and Ken Little just missed Hillhouse's state leading time of 3:29.12 in the 1600m sprint medley relay by a quarter of a second to finish in 12th place of the Championship section with a time of 3:29.37. The Red Raiders became only the 6th team in Connecticut history to break the 3:30 mark in this relay. The Greenwich girls team, led by All American Emily Philippides has been a mainstay at Nationals the past four years. They ran the 4th best time in Connecticut history in the 1600m sprint medley relay, only .03 seconds off Ridgefield's FCIAC record, finishing in 4:07.69 which was good for 18th place. One place behind the Cardinals was Plainfield, whose team of Taylor Balzano, Isabella Newbury and Kate Carleson combined to run a 4:07.72. Indoor and outdoor Connecticut State Open shot put champion Michael Browning improved on his state leading with a throw of 56'0. The junior, who broke 56 feet several times during the indoor track season, finally found his grove with his best ever outdoor throw. In a preview of the future of CT's distance running, 8th grader Aidan Puffer of Manchester took 2nd in the junior high mile with a time of 4:41.51.